If lubrication were perfect, nothing would ever wear out. Close-up of millions of particles stranded together, captured and held by AeroMag. 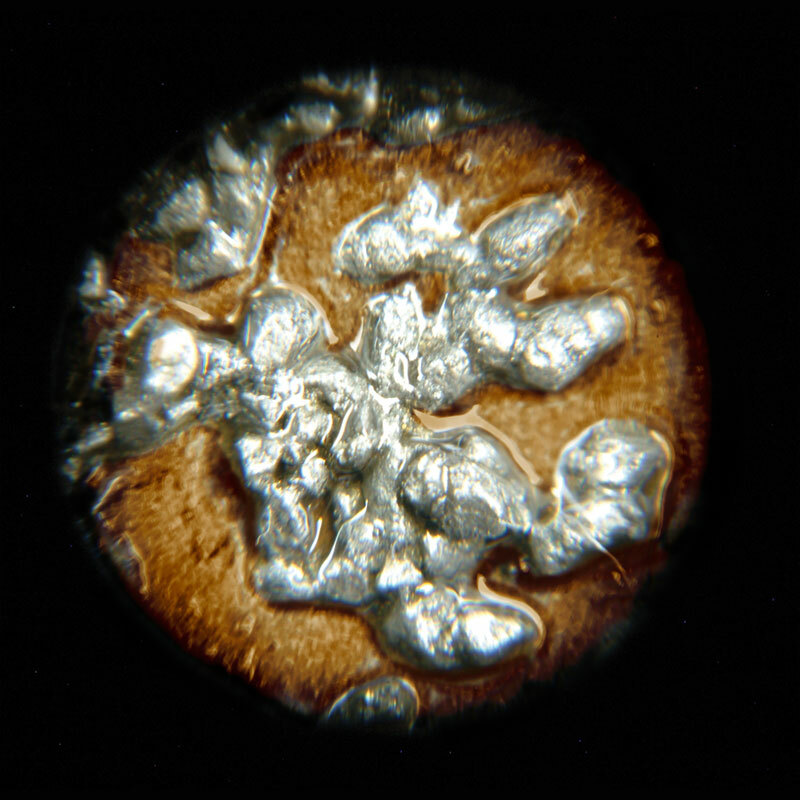 Magnified view of steel particles captured and held by FilterMag. Within the tight tolerances of today’s aircraft engines, normal wear generates tiny steel particles that remain suspended in oil. These particles are so small they pass through the most advanced oil filters. When the oil circulates back into the engine, these same particles are carried into every lubricated space. This particle laden oil will continue to lubricate, but it will also cause an exponential increase in wear while it circulates. The longer oil remains in the system, the greater the wear. AeroMag extracts normal, wear causing, steel particles from oil with its powerful, focused, magnetic field technology without restricting oil flow. These particles are permanently trapped on the inside wall of the filter and are thrown away when you change the filter. Slide the AeroMag off the old filter; snap it onto a new one and it goes right back to work protecting your engine. What will your cut open filter look like? The smaller the particles, the greater the wear. Source: Sayles, R.S., and MacPherson, P.B., “Influence of Wear Debris on Rolling Contact Fatigue,” Rolling Contact Fatigue of Bearing Steels, J.J.C. Hoo, Editor, ASTM STP 771, ASTM 1982, pp. 255–274. MacPherson proved that removal of very small particles (<10 microns) from lubricating oil has a very useful effect on the life of bearings: The finer the filtration, the longer the life. The MacPherson Graph is based upon an accelerated test of ten rolling element bearings. The oil was contaminated with particles from gearboxes. 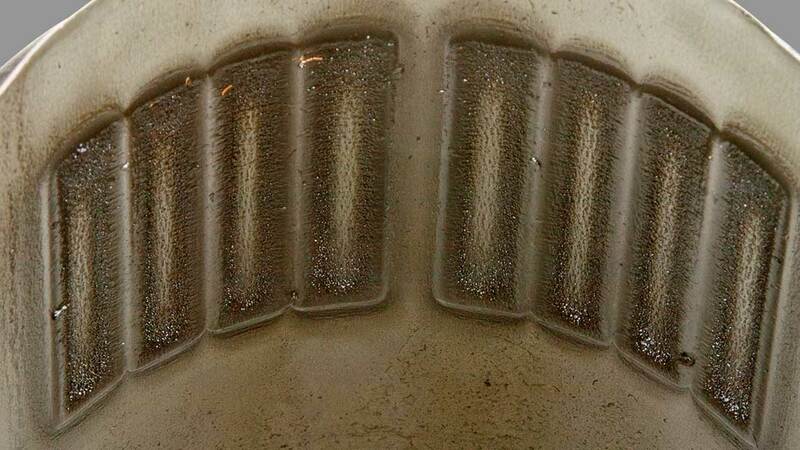 Removing the normal wear particles that pass through conventional oil filters will reduce wear and increase the life of your engine. Experts agree that the smallest particles produce the greatest wear. 1. POWERFUL, HEAT-RESISTANT NEODYMIUM ALLOY MAGNETS are engineered to focus a magnetic field inside your filter. 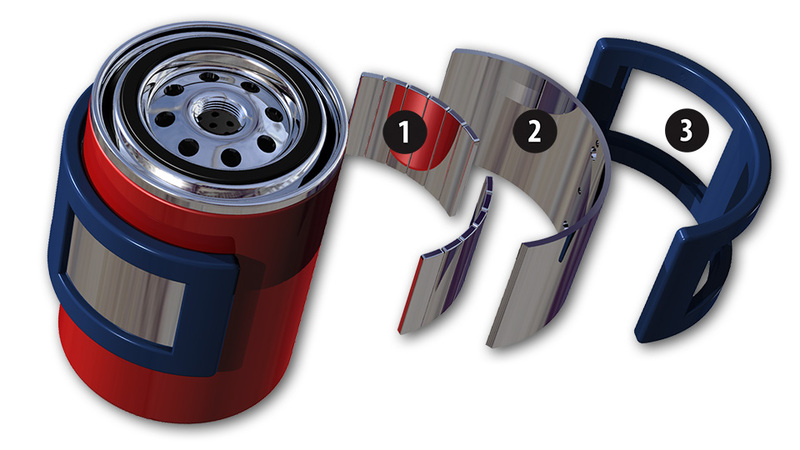 Specifically formulated to remain effective in the most extreme environments, our magnets are guaranteed to remove particles from oil operating at up to 300ºF while most magnets start losing magnetism at 180ºF. 2. PATENTED FLUXCON™ SHIELDING TECHNOLOGY stops magnetic flux which could damage electronic components. Not even a paper clip will stick to the outside of a AeroMag. Our FluxCon™ system also redirects a portion of that magnetic power back into the filter to increase filtration efficiency. 3. RUGGED FLEXIBLE FRAME encases and protects the elements of an AeroMag while providing enough flexibility to fit a range of filter diameters. Our proprietary design and materials are rated for temperatures from -40ºF to +300ºF. 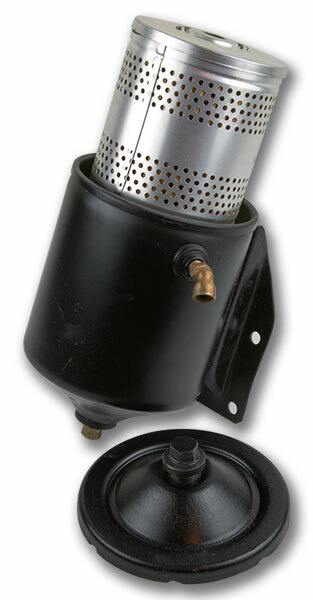 Automotive canister filter cartridge from the ’50s. Modern oil filters remove particles by forcing the oil through paper-based media with very small ports. The technology behind this filtering media is a compromise that has remained relatively unchanged since the 1930s. While oil is necessary to remove these damaging particles, it is equally important that it flows back into the engine fast enough to lubricate all the moving parts. 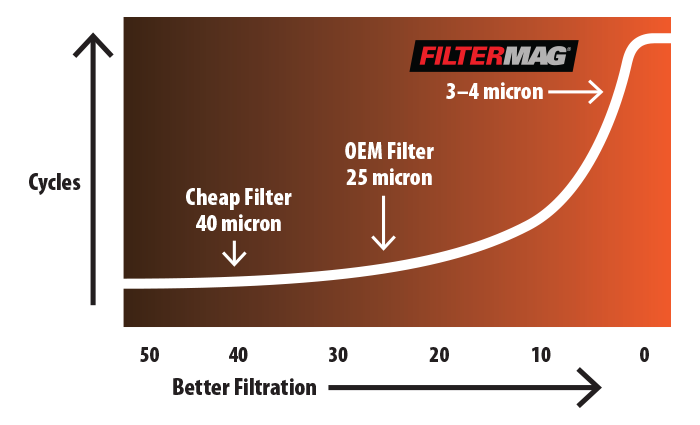 A perfect oil filter media would stop all the particles down to 1-micron (about 1/70th the thickness of a human hair). Unfortunately, a filter with ports that small would also restrict the oil from returning to the engine fast enough, resulting in catastrophic equipment failure. Filter media developments over the years have certainly increased the life cycle for oil filtration cartridges, but fluid dynamics require the ports in the media to remain 25-micron or larger. These tests also confirmed that removal of particles down to 2-micron in size virtually stops the abrasion wear cycle.